One of the biggest draws to Edisto, aside from its unparalleled natural beauty and the feeling of calm serenity that its visitors experience, is its proximity to Charleston. No matter what time of year visitors make their way onto the island, a trip into what us locals refer to as town at least once is essential. Charleston is one of the most beautiful coastal cities in the country. This time of year is one of the best times to visit the city since the weather is crisp and cool and many of the historical areas are fully decorated to celebrate Christmas. So if youre staying on Edisto this holiday season, check out the following activities happening in town that are perfect for the entire family. The story of Scrooge, Tiny Tim, and ghosts of Christmas past, present, and future is well known by all. Its been told time and time again in films, even the Muppets took a crack at it, but theres nothing like seeing it on stage. The Dock Street Threatre is presenting Charleston Stages performance of Charles Dickens A Christmas Carol now through Dec. 18. This performance is suitable for the entire family and tickets range from $22 to $52. Contact the theater at (843) 577-7183 for more information and to reserve your tickets. Another classic Christmas tale is that of The Nutcracker. The Charleston Ballet will perform this holiday favorite like youve never seen it before. The group incorporates and the famous names and places found in Charleston so that the time-honored tale takes on a southern flair. In addition, the Charleston Ballet is partnering with the Charleston Animal Society so that adoptable dogs can find their forever-homes. These dogs will be on stage so that audience members can see them perform and maybe even give one a home. The show begins Dec. 10 at 7:30 pm at the Galliard Auditorium and again Dec. 11 at 3 p.m. The following weekend, check it out at the Charleston Performing Arts Center at 7:30 pm on the 16 and 3 pm on Dec. 17. Get your tickets online at charlestonballet.org. No trip to Charleston would be complete without touring the scenic harbor. Since this area is neglected as far as snow is concerned, Charlestonians improvise and take advantage of the abundance of water that laps at it shores. That is why the high-speed boat that gives tours of the harbor in the warm months known as The Thriller will be slowing down the pace allowing for visitors to sip on hot chocolate and snuggle up close while they go through a makeshift sleigh ride on the harbor. Granted there will be no sleighs involved, but anyone aboard the boat needs to just bring along their imagination. The tours show visitors the historic harbor, which is decorated for the season, and guides will tell stories throughout the trip. Get on board at Vickerys on Shem Creek after calling (843) 276-4203 to plan your tour. Beginning Dec. 15-31 tours will operate daily. Charleston Harbor Tours is also offering a special this holiday season so that visitors from all over can come every weekend for a tour of the harbor aboard the Carolina Belle. This tour lasts 90 minutes and visitors will view more than 75 landmarks and significant points of interest in the city including Fort Sumter, Fort Moultrie, USS Yorktown, and much more. The Carolina Belle is an 80-foot boat featuring two decks and views from every seat. Contact Charleston Harbor Tours at (800) 979-3370 to book your trip. While Edisto Beach is no slouch when it comes to Christmas decorations in the town, even the most loyal of locals will admit that the James Island County Parks Holiday Festival of Lights is something to be seen. 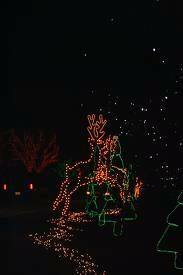 Visitors will think theyve entered the magical world of the North Pole when they begin the three-mile driving tour that features thousands of light displays. Once the driving tour is over, guests can explore the grounds and go on train rides, festive walking trails, be tempted to taste gingerbread houses, ride the carousel, visit the candy shop, and so much more. This event is perfect for the entire family and very affordable. It is $12 per car (up to 15 people) and the additional events cost extra. However, entry is free with eight Greenbax. Call (843) 795-4386 for more information. All of these activities promise to be a good time for families and friends who want to get together, but theres still nothing quite as good as waking up and curling around a warm cup of hot chocolate while watching the sunrise on Edisto Beach and then spending the rest of the day enjoy the islands quiet time. So if you cant bring yourself to leave Edisto during your holiday visit, we dont blame you. Would you like to spend the holidays on Edisto? Browse a great selection of island rental properties here.